Fulham scrapped their way to a 1-0 win over Norwich at Craven Cottage pulling to within 2 points of their rivals on the day in the race for survival. This was a contest fought hard in midfield with desperately little quality in the attacking third from both sides. It was therefore no surprise it was decided by a set piece. Both managers started with interesting formations. Neil Adams opted for a diamond 4-4-2 in his first game in charge of Norwich after Chris Hughton's sacking. Bradley Johnson played in front of the back of the back four with Johnny Howson and Leroy Fer narrow to his left and right respectively. Robert Snodgrass played at the top of the diamond behind a front two of Nathan Redmond and Ricky Van Wolfswinkel. Felix Magath set out with a 3-5-1-1 with Brede Hangeland, Fernando Amorebieta and Johnny Heitinga operating as a back three. Sasha Reither and Kieran Richardson played as wing backs. Mahamadou Diarra played at the base of midfield just in front of the three center backs with Steve Sidwell to his right and Lewis Holtby to his left. Patjim Kasami played off of Hugo Rodallega up front. Norwich dominated the early proceedings. The midfield diamond meant they had four players in the middle of midfield versus Fulham's three and therefore had a free man to provide a passing option and were able to control possession. One of the more interesting tactical features of the opening stages occurred down Norwich's attacking left flank. The diamond 4-4-2 vs. 3-5-1-1 match up meant both sides were playing with only one wide player on each side of the pitch. For Fulham it was the wing backs Riether and Richardson, for Norwich it was the fullbacks Steven Whittaker and Martin Olsson. With Norwich playing narrow, Reither didn't have a direct wide midfielder to mark. As a result he would tuck inside to help even up the numbers in the middle of midfield. 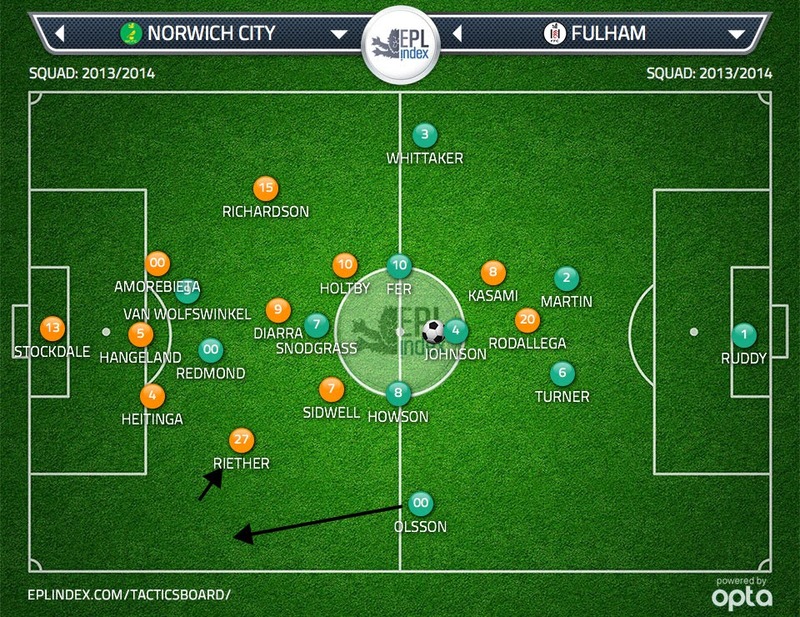 However, this left Olsson with the space to bomb down the left wing unmarked for Norwich (see graphic below). Olsson provided several decent deliveries into the box in the first half. In the 28th minute he found himself again able to advance unmarked down the left wing and provided a low driven cross for van Wolfswinkel that forced David Stockdale into a world class save. Fulham 3-5-2. Reither tucks inside to provide extra protection in midfield. Olsson takes advantage of space on the left wing. Recognizing his side were on the back foot and that Olsson would continue to pose a real threat, Magath changed the home side's shape to 4-5-1. Reither dropped back to left fullback position, Amorebieta slid over to right back. Richardson played as a left midfielder while Kasami moved from his withdrawn forward position to right midfield. The change meant that Reither would have cover from Olsson late runs down the wing as Kasami was tasked with tracking the Norwich fullback when he advanced forward. Reither could tuck inside to offer defensive support in narrow areas knowing Olsson wouldn't be on his own out wide. While the change may have partially mitigated the threat of Olsson it also meant Fulham had no one close to Rodallega when they won the ball back and the Colombian striker was isolated up front. They couldn't find an outlet ball to spring attacks when they regained possession and were left hitting hopeful long balls into Rodallega. Richardson's bursts with the ball down the left channel were Fulham's only means of transitioning from midfield into the attacking third. As it turned out one of these runs from Richardson would be enough for the three points. On 39 minutes he bit Whittaker for pace down the wing and forced the Fulham left back into a late challenge resulting in a free kick. Rodallega tucked in Sidwell's flicked on header at the front post. The Cottagers stuck with the 4-5-1 formation in the second half, seemingly content to hold on to their lead. Ashkan Dejagah replaced Kasami on the right wing after Kasami switched off and allowed Olsson in behind. Norwich then made two like-for-like subs- Gary Hooper replaced the out of sorts van Wolfswinkel and Wes Hoolahan came on in midfield for Leroy Fer. Magath signaled his intent to tighten up and keep the 1-0 lead in the 69th minute when he replaced Holtby for the more defensive and tough tackling Scott Parker. The move proved to be a wise one as Parker battled in midfield and used his fresh legs to break forward and provide late runs to the edge of the area in attack. Adams brought on the 19 year old winger Josh Murphy for the final 10 minutes, replacing Howson. They moved to a 4-4-1-1 with Murphy and Redmond playing on the wings and Snodgrass playing just off Hooper. The changes didn't provide Norwich with any more attacking impetus. Magath replaced the exhausted Diarra with William Kvist in the 85th and the home side was able to fairly comfortably see out the win. In the end this game was predictably scrappy given both sides' struggles in the league and uncomfortable positions at the bottom of the table. Both sides were sloppy and lacking in quality in the final third. A set piece was a fitting way for this one to be decided. Please participate in the discussion.